Funny thing -- I actually didn't get excited until afterward-- didn't have time. The day before (2nd morning of the season) I had passed up an easy shot at one heck of a nice 8 pointer. The biggest deer I'd ever passed up in my life, a nice mature deer. Big chest, big swollen neck -- but I knew there were bigger bucks on this farm, so I let him walk. (Actually I didn't KNOW there were bigger ones, but my hunter's instinct told me there were.) Now it was the 3rd day, and I was naturally wondering if passing up that buck had been smart. As I sat in a lawn chair (yes, a lawn chair) on the edge of a huge field of standing corn, I resolved to shoot the next good buck I saw. The weather was extremely mild and dry. In fact, I was even wearing loafers! At about 10:00 A.M. out of the tall corn a doe comes running flat out, along the open edge of the cut soybean field I was watching. 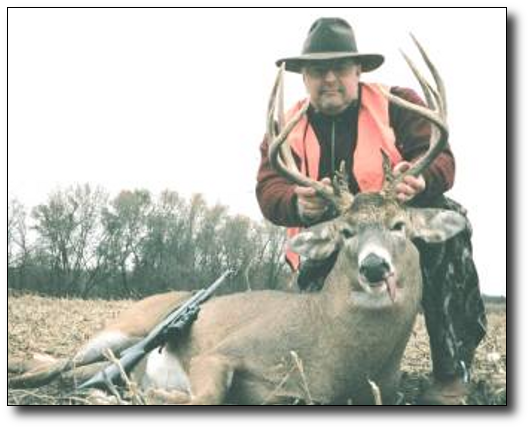 From my previous Missouri hunting experience, I knew a buck would be chasing her, so I leaned forward in the chair and got ready with my shooting sticks. Following her is a tremendous 10 pointer (probably as big as the one I got-- maybe even bigger!) He stops broadside for a second and looks toward me (about 160 yards away), but before I can get the crosshairs on him good, he's gone. But I did see his heavy, very light ivory-colored & symmetrical rack, wider than the ears! WOW! I keep watching, hoping he'll re-appear, and within 45 seconds later, before I can even start kicking myself for not getting a shot at him, out comes another doe, and ANOTHER buck! (We'll call him "Mr. Big") is with her! It's not so easy to accurately evaluate horn size in just a few seconds at a couple hundred yards-- but, as Jack O'Conner said, "The big ones LOOK big." Last year I shot a buck which looked good from the side view, but afterward I found out he had a puny width. Instantly upon seeing the height of Mr. Big's rack from the side, however, I knew he was BIG, and I knew it wasn't necessary to wait around for another view. He could be gone in a second, like that first buck, so I resolved to shoot at the very first chance I got. But Mr. Big is now running back and forth in the open field, wildly chasing this doe. I can't keep him in the scope. I whistle twice to try and stop him, but he ignores me. Now another buck runs out-- but I totally ignore him -- don't even know how big he was. I'm focused like a laser only on Mr. Big. Plus, the second I determined he was a "shooter" I immediately shifted my focus from his rack to just concentrating on getting a clear shot at his chest. Admiring the horns is a waste of time and will only give you "buck fever." It all happened very fast and I wasn't really excited yet. In other words, I didn't KNOW how big he was at this point- - I just knew he was a "shooter". Then he stopped, presenting an extremely quartering-away target at about 150 yards. It was not ideal-- but good enough. Might be the only shot I get. BANG! My .270 bullet actually grazed his right rear flank, leaving a slight mark, before it went into the paunch, angling forward into the chest. The little 140 grain Hornady Light Magnum load, despite it not hitting his spine (nor any other bones) had enough shock effect to drop him in his tracks! "Wow-- I just killed a buck!" I told myself out loud -- I guess to reassure myself that it wasn't just another of my minute-to-minute day-dreams. This was real. Still I'm not overly excited. In fact, I decided I should pace it off as I walked up to him. One... two... three... four... five... But the closer I got, I kept looking at how much horn was sticking up over his body as it lay there on its side. I started getting excited then. As I got closer, the rack got bigger. When I got within 30 yards or so, I lost count of my paces and started running forward. He was HUGE! "THANK YOU LORD!!!" I yelled skyward several times. NOW I'm excited! It was by far MY BIGGEST BUCK IN 38 YEARS OF HUNTING! I later green-scored it at 160 B&C points! Editor's note: This members' residence is in Hurricane West Virginia. The following email exchanges are between Dave and his buddies back home. With Dave's permission I was able to pick and choose the most "entertaining" and "informative" segments of these emails. Sure David -- you can use any comment I make. Those were "captions" for the photos and were meant for Daryl and the rest of the HSP staff anyway, as much as my friends back home. I sing the praises of HSP to every hunter I talk to! It's the greatest thing since sliced bread! 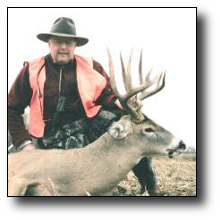 My award-winning taxidermist from my hometown in WV, Paul Cales, says he is going to join. All my experienced hunter friends are shocked at how cheap HSP is considering what you get for it. 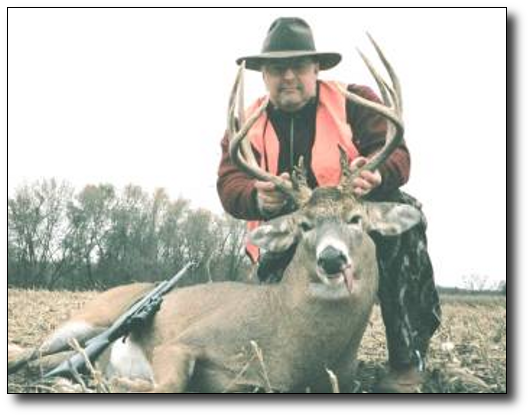 Huge 200+ acre farms-- reserved strictly for my use only-- loaded with real trophy corn-fed Midwest whitetails--- for $50 per day?? HUH ?? Am I DREAMING?? Hunters never claim to be modest! What a buck! All racks have strengths and weaknesses. This shot shows the weakness of this one --- which is: not much width. (not sure what the inside spread is) but I don't think it is more than 15 1/2 inches or so. But MAN -- look at that height! Rear tines are 13"! I was shocked when my taxidermist guessed that this deer will score 156 - 160 B&C points! A DREAM COME TRUE! From this angle the dang thing looks like a decent-sized MULE DEER ---- but, of course, it's a WHITETAIL! Note the gnarly bases with 4 - 5 sticker points. My thumb and forefinger won't touch when I wrap them around the bases. Hey-- what can I say? After 38 deer seasons, I finally had some luck! Driving back from Missouri: MAN did it attract a lot of attention. People were taking pictures of it, honking at me, thumbs up signs, etc.! It felt great, and putting him on top also had the purpose of cooling the carcass down, since the weather was very mild. 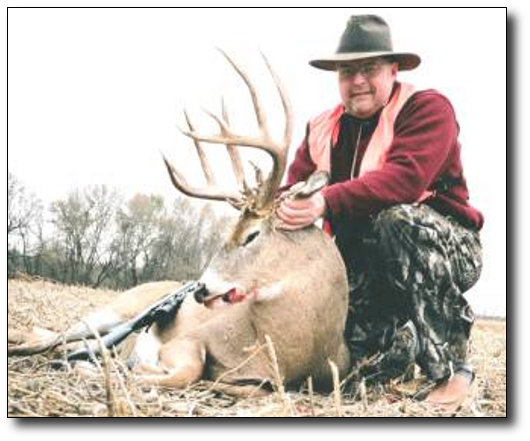 The "golden age" of whitetail hunting is definitely NOW! By Dave Young. 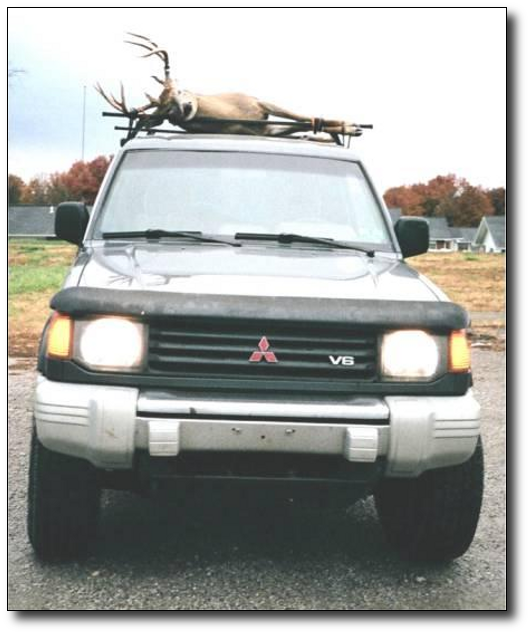 Thanks so much to this member for sharing his story and pictures. We need more member participation!